The Costa Brava holds a special surprise, in the form of botanical gardens. Four proposals that combine the beauty of plants with panoramic sea views. 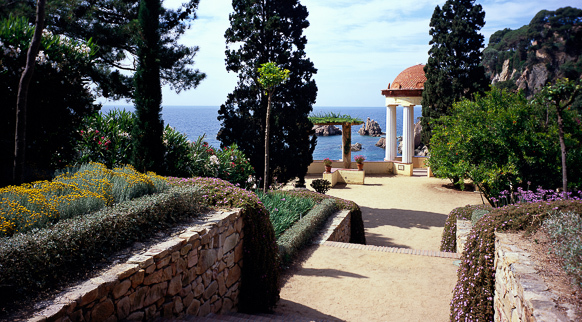 In Lloret de Mar, the Santa Clotilde gardens will surprise you due to the great variety of plants and, strangely, the absence of flowers. The mansion in the gardens houses a collection of paintings, tapestries, miniature boats and Catalan pottery. The Pinya de Rosa botanical gardens, located between Blanes and Lloret, offer a wonderful display of tropical plant species that have adapted to the Mediterranean climate. In Blanes, Mar i Murtra is an impressive biological station, with local plants and trees as well as plant species from all over the world. Finally, Cap Roig Gardens, in Calella de Palafrugell, will charm you thanks to the richness of varieties of trees and plants from all the continents, which are also the setting for the Cap Roig Festival, the well-known musical event.